The only child of KaiNarguran, A baron of Eurynmorr , fair KaiTessa had a privileged life and had always wanted for nothing. 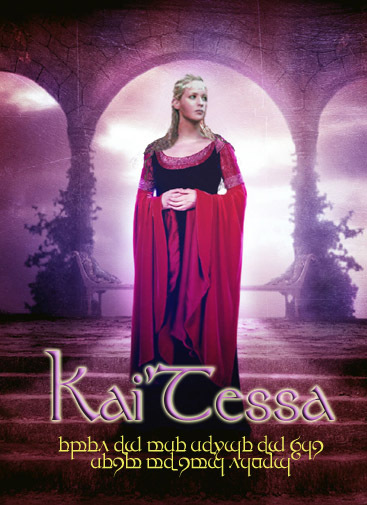 KaiTessa had inherited the grace and beauty of her mother and the charismatic and convincing tongue of her father. The servants and other members of the court were enthralled by her beauty and charm and hence gave her, her own way in everything. Consequently by the time she had turned 100 years old, she was tyrannical and selfish as an elf possibly could be. And from childhood to adolescence, her family did not, or chose not to see this disturbing development in her character. KaiTessa had only no real friends while growing up which was a pity because she might have learnt to be less selfish and proud. The closest thing she had to a friend was a little green snake called Vert Sertarth, which she had found, newly emerged from his egg in the garden. She had kept it hidden in her pockets and by the time it was discovered, Tarth was poisonous enough to discourage anyone from attempting to remove him from KaiTessa. KaiNarguran believed that his daughter should have the best of education in the ways of the court and of sorcery, which his little princess had shown an affinity for, as had all other members of the family. The first tutor, who was engaged to educate her, was as the other members of the court, initially charmed by her but soon realized that she was so used to having her own way and was a most unruly student. She would listen when she chose to and totally disregard him when she felt like it. He resigned his post in 5 new moons. And when other tutors came to fill the position, they always went away in a shorter time than the first (sometimes they departed screaming through the corridors when Tessa grew tired of them and set her familiar Tarth, a little green snake, on them). So if Tessa had not really chosen to want to learn what went on in her fathers court and to be with him when he met all the fascinating dignitaries who visited Eurynmorr , she wouldnt have learnt any lessons at all. The same could be said for sorcery, she learnt only spells that were useful to her and did not bother with those that werent. 9 years and 17 tutors later, KaiNarguran had to face the fact that his daughter, though pretty and charming (when she wanted to be) was not learning the lessons nor developing the character that she needed to become an aristocrat and leader, worthy of the family name. On the advice of one of his advisors, Gaeriuss second son, Auremyr Aerelendil, a ranger, was sent for and asked if he would accept her as an apprentice and to follow him on his quest to the Somber Woods. Tessa was obviously not too thrilled to be sent away from her comfortable home and travel around with the possibility of having to sleep out of doors without anyone to wait upon her. Moreover being apprenticed to Auremyr would mean that she would have to look up to him as a superior and that definitely did not sit well with her. She pleaded and cajoled with her father to change his mind on this matter. Finally resorting to throwing a temper and refusing to go. But for once KaiNarguran was unmoved by her and on the eve of midautumn she left her family home with Auremyr. Even dressed in the simple garments of a yellow tunic and royal blue cape, KaiTessa of Eurynmorr was striking to look at. Her long pale gold hair, loosely braided down her back and her bright violet eyes which contrasted strongly against her pale skin. She did not look at all pretty however as she rode out of Eurynmorr with Auremyr. Her expression was dark and angry and her lips formed a stubborn pout. She had refused to speak to him when they were introduced merely giving him a slight nod of acknowledgement. Alignment: Neutral Age: 109 Height: 5' 5"